Sid Meier's Civilization III is a turn-based strategy computer game by Firaxis Games, the sequel to Sid Meier's Civilization II. It was followed by Civilization IV. Also called Civ 3 or Civ III for short, the game is the third generation of the original Civilization. The game offers highly evolved gameplay in terms of both mechanics and strategy. 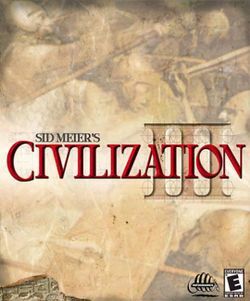 Unlike the original game, Civ III was not designed by Sid Meier, but by Jeff Briggs, a game designer, and Soren Johnson, a game programmer. Civilization III, like the other Civilization games, is based around building an empire, from the ground up, beginning at start of recorded history and continuing beyond the current modern day. The player's civilization is centered around a core of cities that provide the resources necessary to grow the player's cities, construct city improvements, wonders, and units, and advance the player's technological development. The player must balance a good infrastructure, resources, diplomatic and trading skills, technological advancement, city and empire management, culture, and military power to succeed. This page was last edited on 16 August 2016, at 17:44. This page has been accessed 28,764 times.